Close up view of a cosmetic procedure, the beautician applies the beauty mask on the beautiful young female face. Skincare, face care, pampering. Getting a facial treatment. 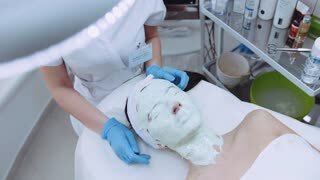 Woman lying on the cosmetologist’s table, face completely covered with the organic beauty mask, cosmetologist standing near. 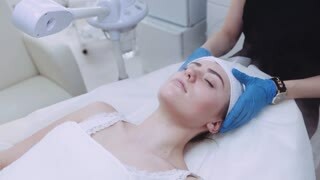 Therapeutic effect, modern cosmetology, facial therapy. Strong male hands of professional masseuse slapping woman’s back. Relaxation time, healthy lifestyle. Spine therapy, spa activities, pampering, thai.